Feeding off of Thursday’s strong selling, Friday’s bearishness may have been a little too zealous from the get-go. Before the closing bell rang, the bulls were back to testing the waters, whittling the day’s loss down to only 0.21% for the S&P 500. The intraday rebound leaves stocks on unclear footing headed into Monday’s trading. 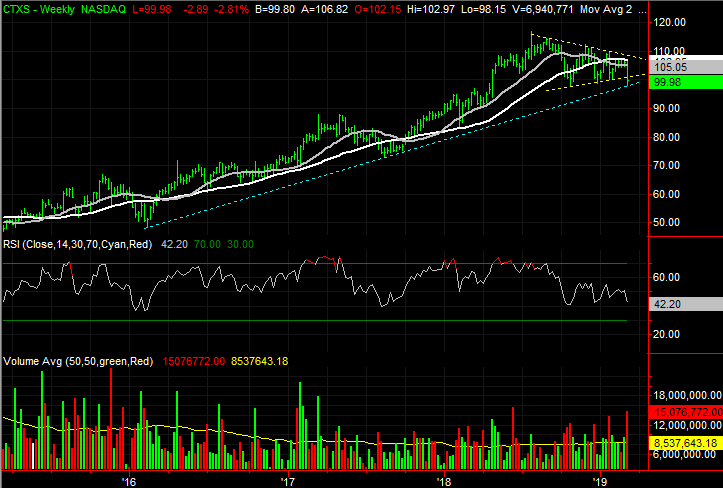 Kroger (NYSE:KR) was a key laggard. After losing 10% on Thursday after reporting disappointing fourth-quarter numbers and dishing out a lackluster full-year profit outlook, the sellers dug in again to leave of nearly 5% lower on Friday. National Beverage (NASDAQ:FIZZ) lost even more ground, however, falling 15% in response to earnings and a downgrade from Guggenheim, but perhaps also in response to some strange comments from CEO Nick Caporella. There were a handful of winners. Funko (NASDAQ:FNKO) popped more than 11%, snapping a four-day losing streak, fueled by the potential of a new children’s book series. There just weren’t enough Funko’s to drag the broad market out of the red. As Monday’s trading action gets going, stock charts of Johnson Controls (NYSE:JCI), Citrix Systems (NASDAQ:CTXS) and Coca-Cola (NYSE:KO) are the names that should be on traders’ radars. Here’s why, and what to look for. The big bearish gap Coca-Cola shares left behind last month may be aching to be filled in, but there’s no particular timeframe the market has in mind when it makes a point of filling in those gaps. It happens when it happens\. And, with that as the backdrop, one more bearish day could drag Coca-Cola shares under a pivotal support level that could easily incite another wave of selling. 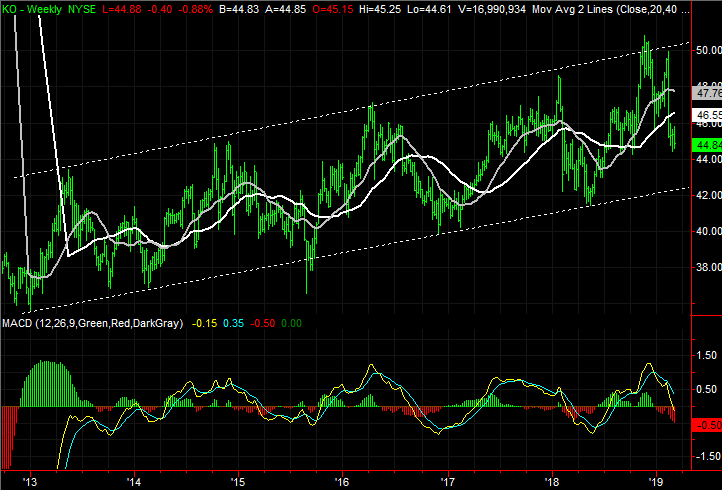 • The support line in question is around $44.40, where KO has made a low several times since August if last year. It’s plotted in blue on the daily chart. • Zooming out to the weekly chart of KO, we can see much more basis for the current retreat. Though the stock tried to buck the trend in February, the parallel support and resistance lines that prodded last year’s advance and the pullback since November have been in place since 2013. • If the floor around $44.40 fails to hold up, the pattern says Coca-Cola stock could slide all the way back to the longer-term floor around $42.20. With nothing more than a quick glance, Johnson Controls looks like a decent long bet. It pushed its way back above its 200-day moving average line last month, and though last week it looked like it might fall back under it, the bulls stepped up to the plate on Thursday and Friday when most other stocks were getting thumped. When one takes a step back, however, it becomes clear that JCI shares still have a massive hurdle to clear. Crawling above it could be a huge bullish catalysts, but doing so would have to break a long-standing pattern. • The 200-day moving average line is plotted in white on both stock charts. 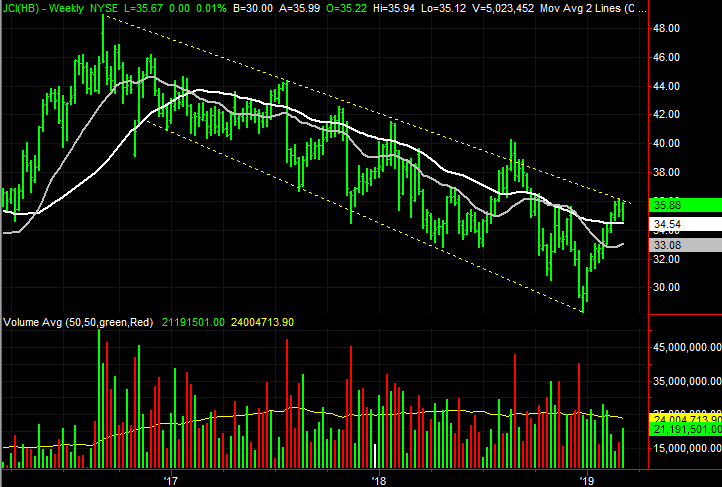 That line served as a ceiling late last year, but failed to hold the rally back last month. • Although they’re not perfect, Johnson Controls shares have been guided lower since early 2017 by a falling set of support and resistance lines, plotted in yellow. • Ironically, the worst thing that could happen here is a decisive one-day breakout thrust that only invites profit-taking thereafter. The more sustainable advance out of the channel would be slow and calculated. Near the middle of last month we cautioned that Citrix Systems shares were stuck in a narrowing range, but struggling to move higher even within that range. Most of its moving average lines had started to keep rally efforts in check. Nothing really changed in the meantime. Though it took some time for the grandmother of all moving averages to get full bearish traction, that finally happened last week, in spades. Though we may see a bounce effort today, some major damage has been done. One more rough day could push CTXS over the edge. • With Friday’s good-sized loss, Citrix has broken below the lower edge of a converging wedge pattern that has contained the stock since the middle of last year. • Bolstering the bearish case is repeated resistance at the white 200-day moving average line, most evident on the daily chart. After so many failed attempted to clear it, the bulls finally gave in. • The bounce from Friday’s low is noteworthy, as it matched the low made in October. The bulls may have drawn a line in the sand there. If that support, plotted in green, is broken though, there’s nothing else to keep shares propped up. The post 3 Big Stock Charts for Monday: Coca-Cola, Citrix Systems and Johnson Controls appeared first on InvestorPlace.